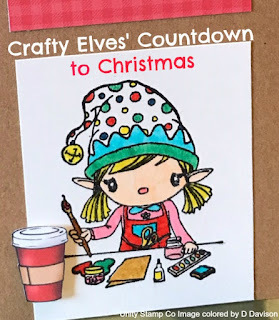 Life of a BZscrapper: Crafty Elves' Countdown to Christmas-February 2019 Edition! 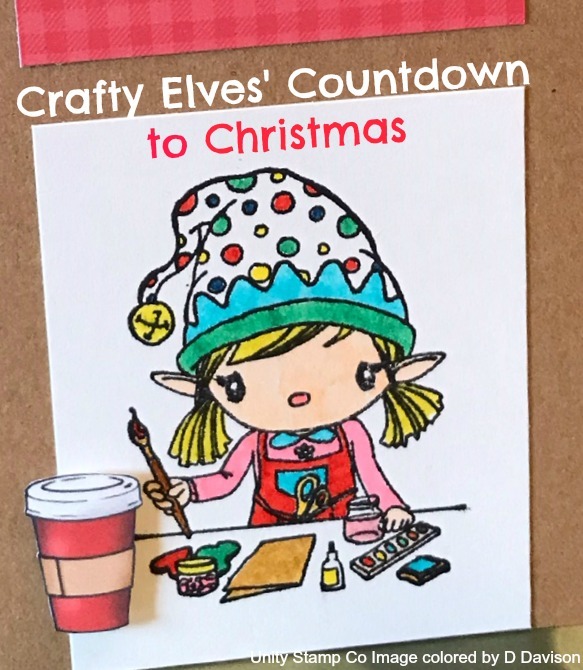 Crafty Elves' Countdown to Christmas-February 2019 Edition! Welcome to this month's Crafty Elves post! My friend Debra Davison (from Meticulosity) and I have promised to make a Christmas card a week for the year so that when the time comes, we'll have this part of our holiday all set! I might even get my cards mailed out on a timely schedule... maybe... lol! I especially love that it gives me the opportunity to use some of the many new products I purchased over the holidays that might otherwise be sitting and waiting for next November/December! And stay tuned because at the end I'll be announcing the winner from the comments on our first Crafty Elves post in January! 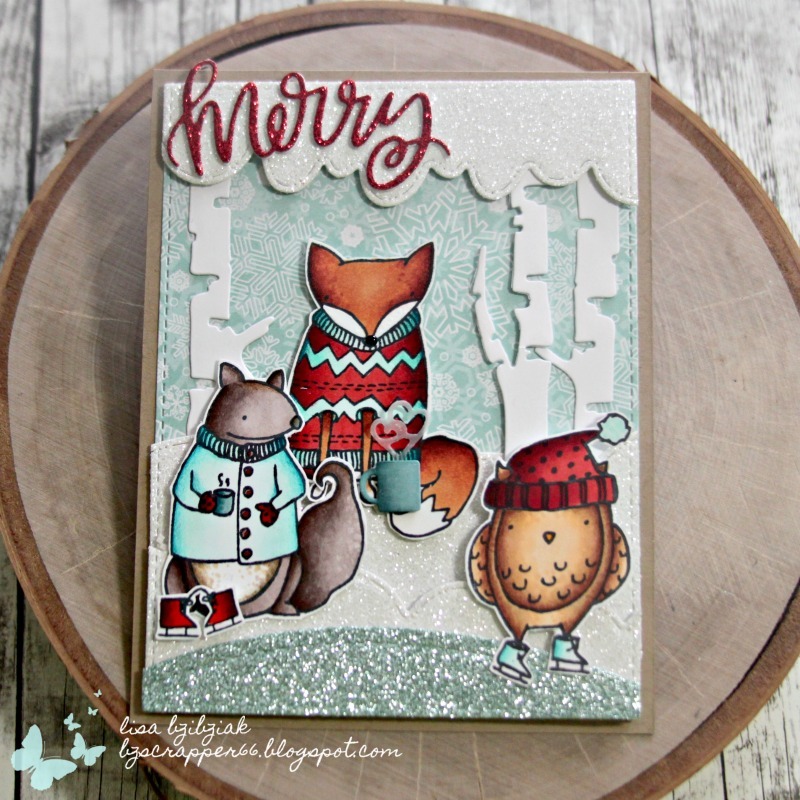 So let me just say that as soon as I saw this Happy Holladays stamp set by Darcie's Heart & Home over at Butterfly Reflections Ink I didn't even have to think about throwing it into my cart. I knew I had to have it! So many of my favorite things... coffee, that sweet deer, plaid, and that handsome lumberjack hipster santa.. I mean... cuuute right?? It was fun to use that pretty plaid from an old CTMH paper pack along with dies from Paper Smooches, Craftin Desert Divas, Lawn Fawn, and Pretty Pink Posh! And it was also fun to use some denim material to texturize Santa's jeans.. tee hee.. love him!! 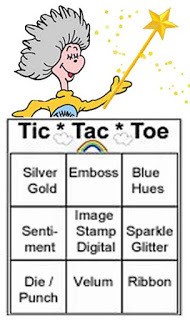 I'm linking this one up over at Double Trouble Challenge... this week there's a tic tac toe board and I'm taking the middle row across... Glitter, An Image, and a Sentiment. (The board is at the end of this post) That was easy enough! And I've met the twist which is Magic... I'd say that Santa and Rudolph are pretty magical (not to mention Coffee... it's made from a magical bean that turns me into a human being every morning!). And since I met the twist, I can also enter into the Use Your Stuff Challenge which is Magic this time around! They're partnering with Double Trouble and you have about a week to enter both challenges! 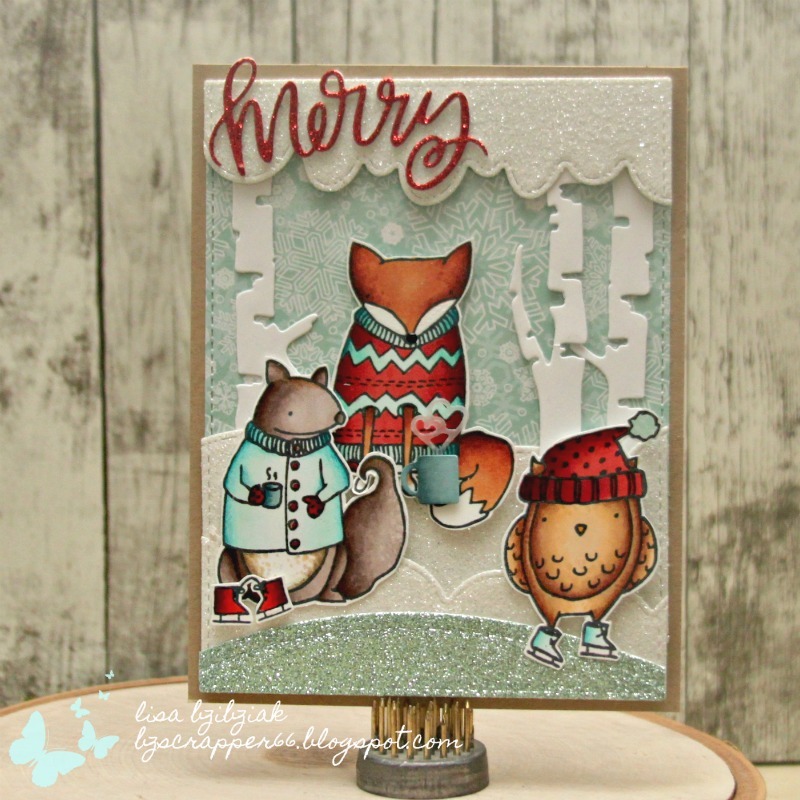 O M Garsh I LOVE these adorable critters from Elizabeth Craft Designs... they are from the Winter Animals stamp set...so adorable! I love how they all coordinated their outfits to go ice skating...maybe their mom was planning a scrapbook page and already had the papers picked out. 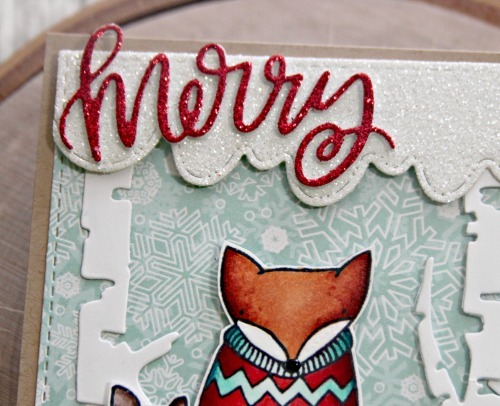 And then this Merry from the Merry Christmas word die from Pretty Pink Posh... I LOVE how it just happened to fit in the scallops perfectly! This is one of my favorite word dies... you're gonna see it a lot this year! And I almost forgot to mention that beautiful background snowflake paper from the Blizzard paper pad by Gina K.. LOVE!! Did I mention I love this stamp set! Wish I'd remembered that I did purchase the dies before I cut these out by hand...lol! Oh... and if you are hoping you see this one in your mailbox next December... it's already spoken for. You know who you are.... lol! I'm playing along with Festive Fridays over at the Outlawz Challenges on Ning... the themes are Birthday, Get Well, Anniversary/Wedding, Christmas, and Anything Goes, so I'd say with Christmas, I'm good...lol! I'm also playing along over at Mod Squad Challenges to use a Clear or Rubber Brand Name Stamped Image... 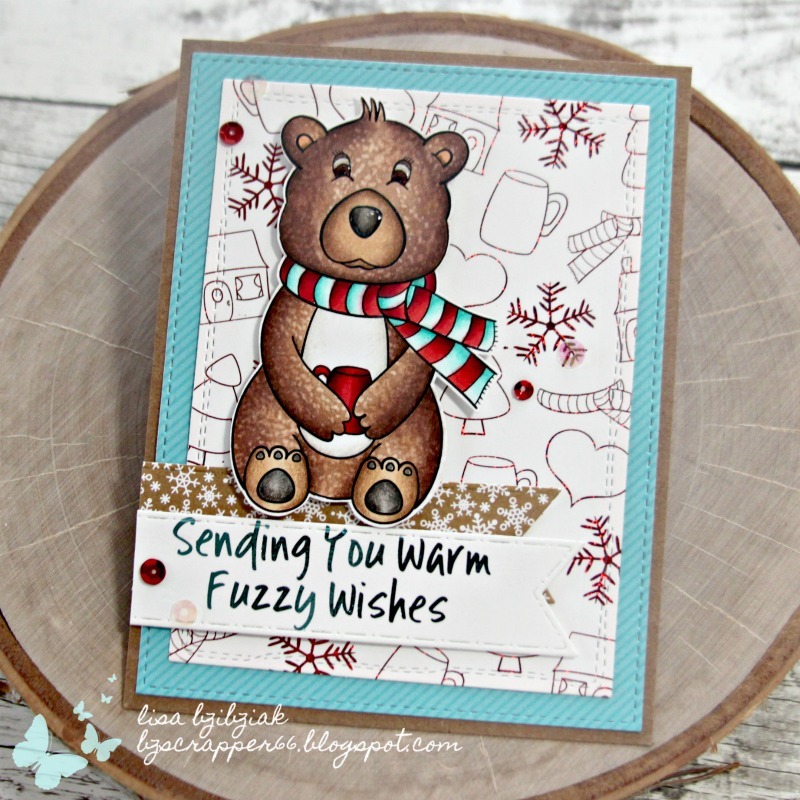 I've used Elizabeth Crafts stamps on this one! 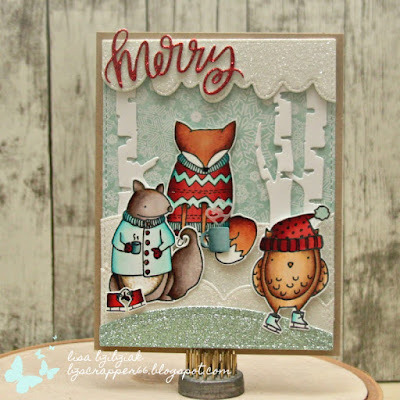 I started this one with a beautiful paper from the Rustic Winter Wishes digital paper set... that plaid... I wasn't sure if I'd foil it or not and decided not... then I thought I'd add some snowflakes with a stencil from Newton's Nook and some Deco foil transfer gel and foil those... so I added the gel and as it was drying I realized that wasn't going to work because the snowflakes would take the foil but so would the paper since i printed it on my laser! So instead I added some gold embossing powder over the gel and heated it. It's so much fun to watch it heat because it bubbles and has so much movement! Crisis averted! 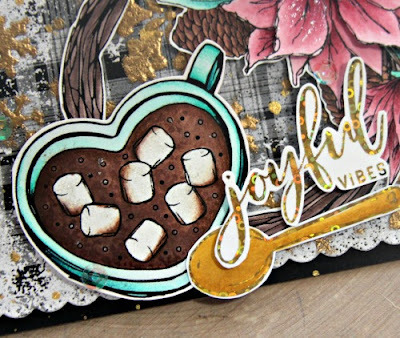 I printed a bunch of images from a few sets from Graciellie including Coffee or Cocoa, Christmas Cheer, and Winter Wishes and colored them with my Copics and added a little detail with my Prismacolor pencils. I added a little sparkle using Liquid Pixie Dust from Ink On 3... love this stuff!! I added it to the marshmallows and the poinsettia...just dropped a little into a container... just a tiny bit... and applied it with a paint brush. I foiled the spoon and the sentiment... love that Gold Sequin foil from Gina K!! 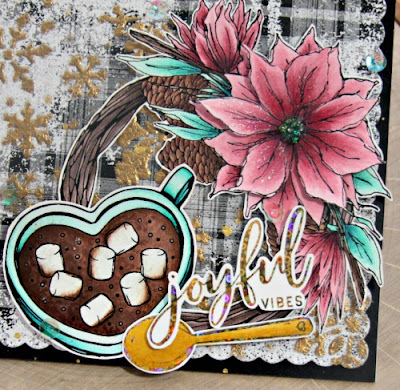 I used one of my fave layering dies from Waffle Flower Stamps on this one! I printed lots of images from these sets and can't wait to use them! I've had these images from Polka Dot Orchard printed and hadn't had a chance to use them yet so I was excited to use them this month! That sweet bear! There is something about his snout that reminds me of my dog... lol! He's from the Winter Bear digital stamp set. I colored up Winter Bear ... the furry parts first and then used some material from an old wash cloth and some Copic Blending Solution to texturize it. And I love that the set comes with that adorable background already made up! I just printed it; die cut it, and ran it through my Minc with some red sparkly foil from Gina K! And that nose was perfect for some liquid glass... I just wanna boop it! 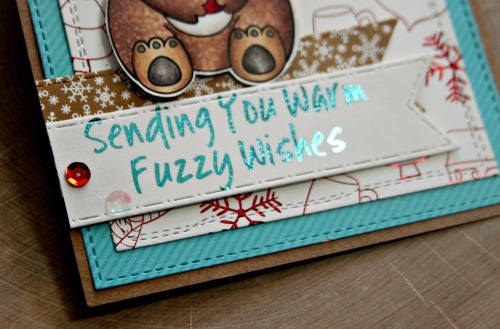 When I print my sentiments I'm sure to leave room around them so I can use dies to cut them out... and then I foiled this one with some turquoise foil... perfect with the color scheme! I love that the Gina K Designs foils come in a flat pack so I don't have to deal so much with the curling... it's tricky enough as it is!! I used dies from Kat Scrappiness, Stamplorations and Craftin Desert Divas on this one. He's such a cutie!! Also printed out some more images from Polka Dot Orchard so I'm sure you'll be seeing those in a coming month's post as well. Vannessa, please email at bzscrapper66 at gmail dot com with your address and also your blog address and/or Instagram if you have one... I'd love to see the cards you've created so far! And hey! Let's do it again! I have lots of cards to mail out so leave me some love and I'll pick a winner and announce it in next month's post! 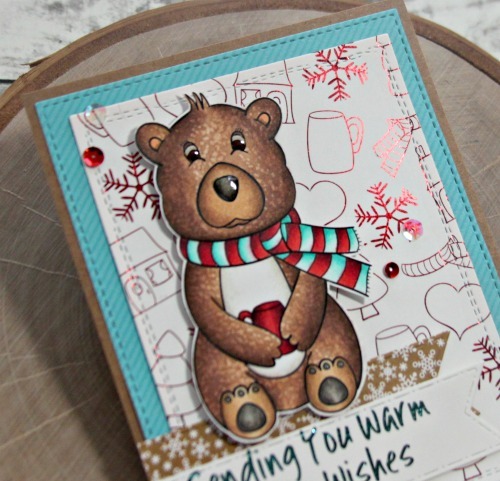 Now head on over to Debra's place and check out what she's created for you today! You KNOW I love these!!! Still LOVING that 'flannel' Santa is wearing!!!!!!! These are FABULOUS!!! And LOVING that bear!!!!!!!!! You are amazing!!!!!!!!!!!!!!!! You've done a fantastic job on all your cards. I tried to pick a favorite and could NOT do it. ;) At first I thought it would be the Santa (cool coloring of his shirt, etc.) but kept on scrolling down and each one was just so CUTE! :) Good job....there are going to be some happy people receiving your beautiful cards next Christmas. I spy coffee in every single card! lol Cuz it turns me into a human, too. hehe And you know I adore every single, amazing, card!! Love the sparkle and the foiling. And the images! All adorable. OMGosh! I Love them all! I'm so excited to see you making Christmas cards through out the year! I look forward to the 25th of every month now!!! I can't even decide which card I like best because they are all amazingly beautiful!!! 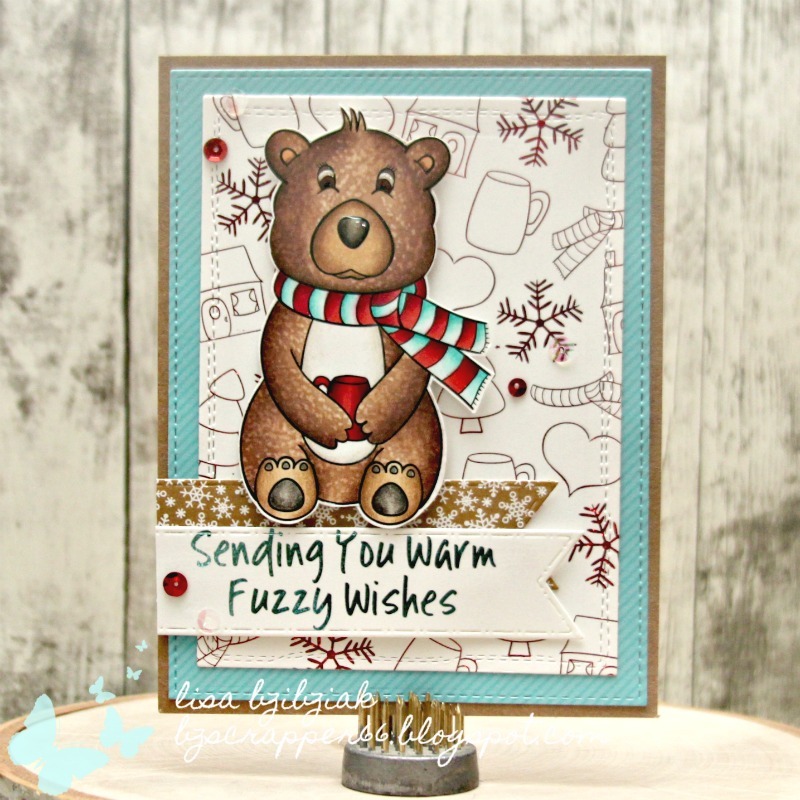 The bear image looks fantastic with the texture coloring you did! I also love the background foiled! It was funny to see that since I made 2 cards last night doing the same thing with some PDO files! Great minds think alike! Hahaha I have some Christmas cards to share tomorrow on my blog. Played with slider cards for the first time! Have a wonderful day! Congrats Vanessa! And I LOVE ALL OF THESE LISA! Especially the first one! 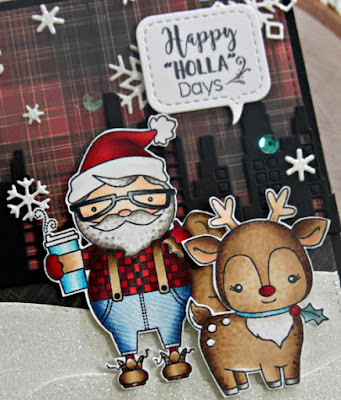 That lumberjack santa is TOO CUTE! Very fun cards! You are getting a nice stash of holiday cards going! 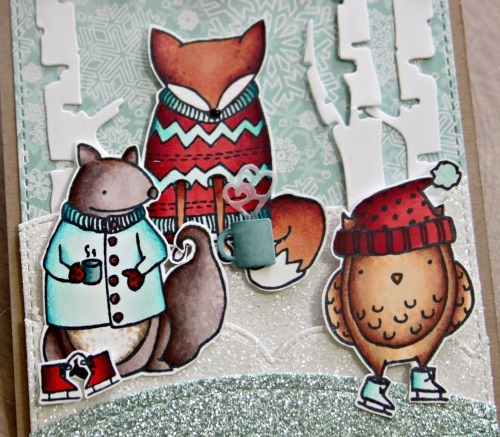 Love the winter scenes you created for cards #1 & 2! WOW! Awesome Christmas cards! 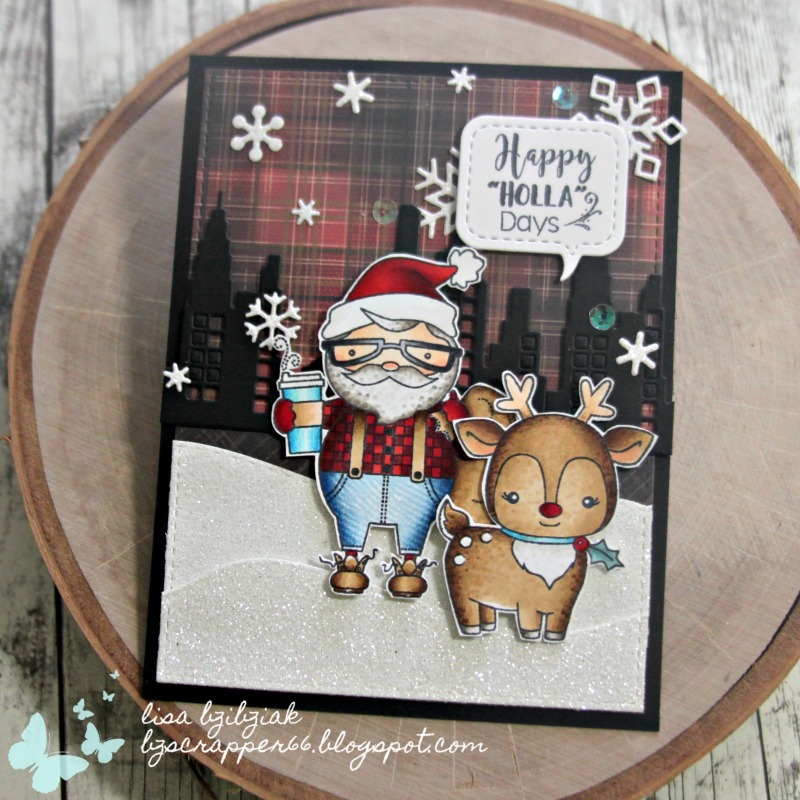 I especially love the card with the Santa and plaid background very unique! What a beautiful card! Love the touches of our Deco Foil products! Wow! I love these and thanks for sharing. I love how you used the pattern papers for the sky lines in the scene ones. I should try that too. Wonderful cards. I really like the scenes you created on the first two. Lisa, your cards are out of this world!! Love each and every one!! Lisa, they are all lovely cards again this month but the Gracielle poinsettia and hot cocoa cup are my favorite. I was excited to see I was the winner of last months prize! You made my day thank you so much! I did email you! Ummmmm, trying to decide which is more magical...I think it's a tie. That reminds me I haven't had my coffee yet...I'll be right back. Your cards for Christmas are so adorable Lisa and maybe this year you will get them out in time...lol. Thanks for sharing this with us at Double Trouble and please come back with some more of your magic. Fantastic cards each one is on the adorable simply wonderful scale! Be There Or Consider Yourself Square! I LOVE all things papercrafty! So glad you could stop and check out my creations! Hope you'll come back soon! And if you leave me some love and let me know you were here I'll visit you right back if I can find you! I'm on the Team! Happy Dance! Honored To Design for CAS-ual Fridays! Stamp Sets are 70% Off Now!! Use Code Sale70. Love Me Some Paper Sweeties! If You Love It-Share It! Stamp With All Your Art! Cutting Cafe Inspiration - Shadow Box Cards! Caffeine Fueled Paper Play - Paper Smooches! Paper Sweeties February 2019 Release Rewind! Paper Sweeties February 2019 New Release Party! The Cutting Cafe Inspiration - Valentines! 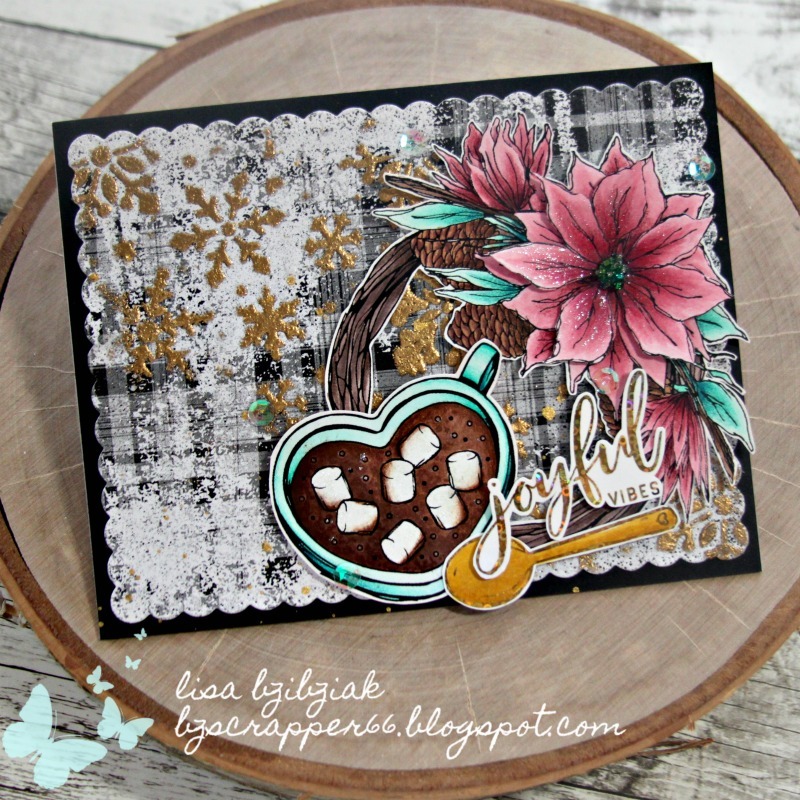 National Cocoa Day with Stamps of Life! National Coffee Day Blog Hop 2018! 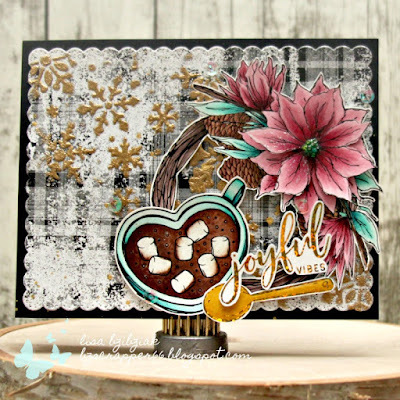 Coffee Loving Cardmakers-Fun Stampers Journey Collaboration Hop! 25 Days of Christmas Tags - CAS-ual Fridays! The Rabbit Hole Designs Preview Day - Love You More! Coffee Loving Cardmakers - Our Daily Bread Designs Collaboration! The Cutting Cafe Inspiration - Best Fishes! Joy Clair/Coffee Loving Cardmakers Collaboration and Blog Hop!